Massachusetts Jobs with Justice is a coalition of community, faith, and labor groups in Massachusetts organizing working people and allies to fight for the rights of all workers: locally, nationally, and internationally. East Boston: International Workers Day Rally! 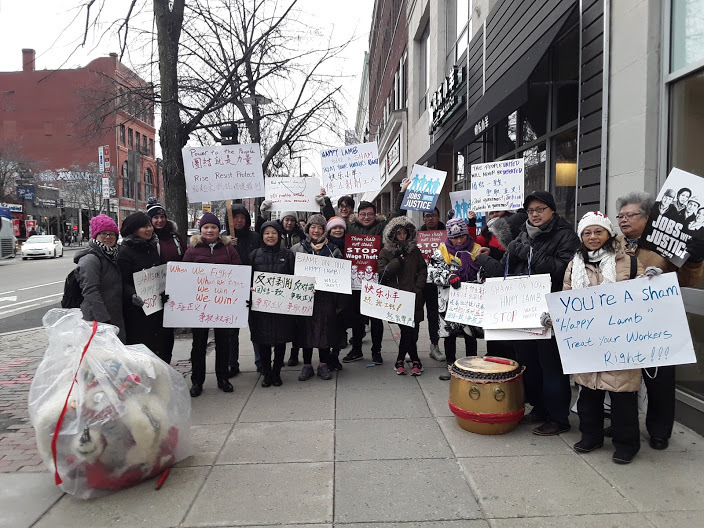 Rally to support workers at Happy Lamb Pot fighting abuse and wage theft in Cambridge, February 27, 2019. Massachusetts JWJ has a number of current and ongoing struggles in the areas of Immigrant Rights, Worker’s Rights, and Education Justice. There’s always a way to help whether it’s signing a petition, joining a committee, attending a hearing, phone banking, or canvassing. Below are a few of our active struggles and related action items to learn more and participate in bringing justice to Massachusetts workers and residents in ways great and small.